Exactly How Worrisome is Bullish Sentiment? Contrarian investors love to use sentiment as a general overbought/oversold measure. There’s no denying that Wall Street and Main Street have surrendered to the allure of higher prices, but just how much of a threat does bullish sentiment pose right now? If you have skin in the game, you probably know something about the game. If you have money invested in stocks, you probably have noticed the increasingly bullish forecasts. Sentiment is a valuable contrarian indicator, but exact danger levels are difficult to quantify. How worrisome is the current bullishness? We saw a rare phenomenon in early January. Investors turned bullish, but the media publicized the bearish implications of bullish investors. The January 13, Profit Radar Report pointed out the following: “Last week’s most notable development is the uptick in investor optimism. This normally contrarian development is tapered by the unusual media attention. A contrarian indicator with so much mainstream attention is not contrarian anymore. Hopefully a continued move (perhaps through a laborious process) to around 1,490 will silence the contrarian publicity and better align overall sentiment with our upcoming technical short setup. The S&P 500 has rallied 40 points since mid-January and did indeed silence suspicious media outlets. Bloomberg: Nouriel Roubini Faces the Music: Did Dr. Doom get it Wrong? This is the most bullish I’ve seen the media in well over a year, but admittedly my self-composed “Headline Sentiment Index” lacks the trackability needed for a good indicator. Other sentiment gauges do have a long track record and the Profit Radar Report takes a detailed look at four of them every month. Below is the January 2013 Sentiment Picture (the Profit Radar Report prepares one detailed Sentiment Picture per month for subscribers on record). Like gauges in your car’s instrument cluster, the monthly Sentiment Picture provides a quick summary of what’s going on. Illustrated are the CBOE Volatility Index (VIX), Equity Put/Call Ratio, the percentage of bullish advisors/investors polled by Investors Intelligence (II), and the American Association for Individual Investors (AAII). 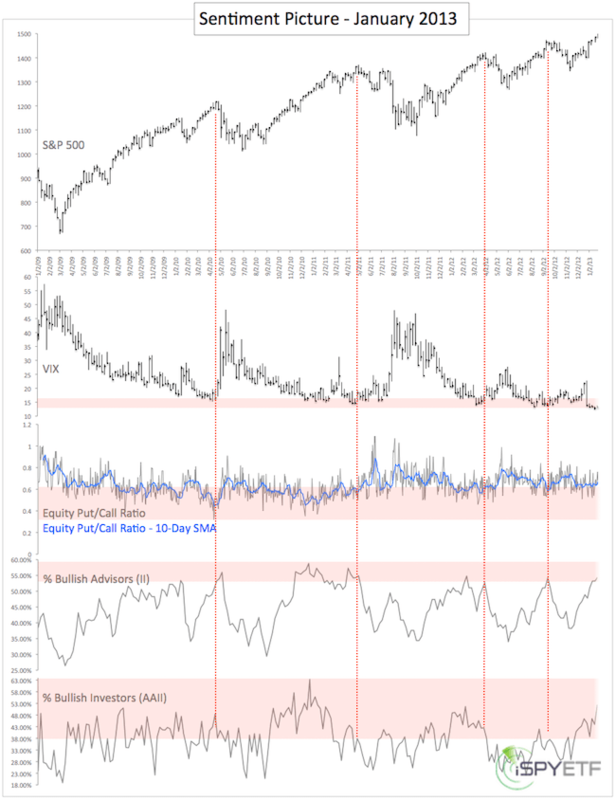 Shaded red areas denote the minimum/maximum sentiment extremes seen at prior highs. The VIX is in danger territory (red box). The Equity Put/Call Ratio is not per say in danger territory, but not far away from where a market top could be. The percentage of bullish advisers polled by II is getting in the red danger zone. The percentage of bullish investors polled by AAII is in the red zone. Investor enthusiasm is high enough to where it could cause a sizeable correction, but not extreme enough to force a turnaround. A break below support would probably elicit more selling. And one thing is for sure, there are plenty of buyers that could turn into sellers and drive prices lower. The Profit Radar Report pinpoints the support levels that, once broken, will cause more selling. Will a ‘Bad Apple’ Spoil the Rest of the Market? An apple a day keeps the doctor away or so the saying goes. Up until recently Apple (as in AAPL) also kept any bear market away. rising AAPL = rising stocks. Theoretically falling AAPL should = falling stocks, but that hasn’t been the case. Why? And is that bullish or bearish for the broad market going forward? The chart below shows the percentage gains of AAPL and the Nasdaq Composite since 2012. Until mid-November AAPL and the Nasdaq traded directionally in sync. Rising AAPL = Rising Nasdaq and vice versa. That changed by late November, when Apple started heading south and the Nasdaq north. How can this be? Other companies started to pick up the slack and fill the void Apple left behind. Google for example started to rally in November. So did Microsoft, Oracle, Amazon, Cisco, Qualcomm, and others. The second chart illustrates GOOG’s recent counter-AAPL performance. As shares of other technology sector stocks rallied, their market cap and weighting in the Nasdaq increased. As AAPL tumbled, its weighting (and importance) in the Nasdaq and S&P 500 decreased. Not only did Apple shares tumble 35%, its weighting in the Nasdaq did the same. It fell from over 20% to 13%. At its best, AAPL accounted for nearly 5% of the SPDR S&P 500 ETF (SPY) compared to 3.62% today. Apple’s relevance to the overall U.S. market diminished as Apple shares spiraled lower. The chart below is an updated version of the log chart I first introduced in an August 24 video analysis about Apple. A later issue of the Profit Radar Report recommended to go short with any push above 700. Getting back to the log chart of Apple; the black parallel trend channel provided a target for the high as well as an initial target for the first leg down. 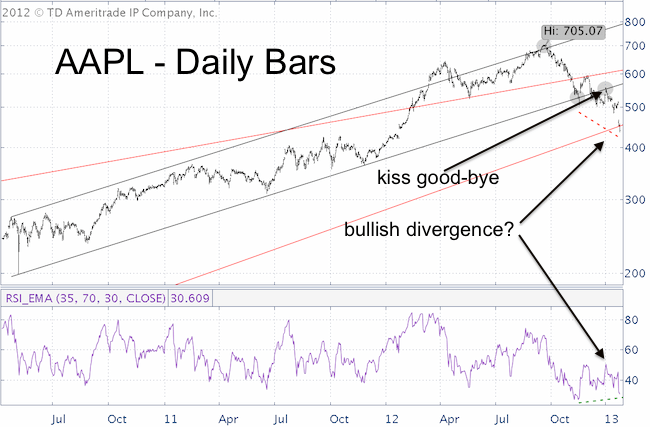 After back testing the lower parallel channel line once more (kiss good bye), AAPL embarked on the next leg down. 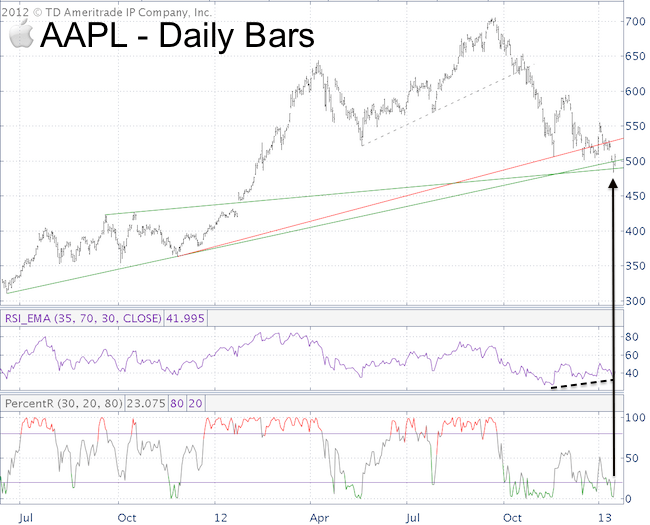 On Friday, AAPL closed below support, now red resistance. RSI has not yet reached a new low to confirm the price low. This could be the setup for a bullish divergence, but I would wait for more confirmation in the form of a close back above the red line. Use that trend line as basis for your stop-loss, because I am following a new parallel channel and a break below this channel support could trigger a bearish technical break down pattern with a significantly lower price target. Interesting Apple developments and possible profit opportunities will be covered by the Profit Radar Report. 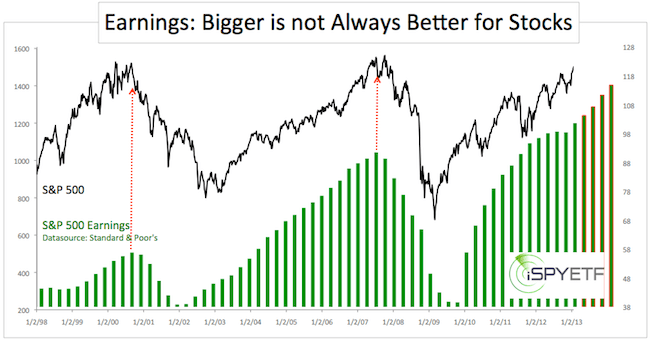 Earnings Euphoria: Precursor to Bearish Mean Reversion? Corporate America has never before seen higher profits than now. Are healthy profits a reflection of a healthy economy or have earnings reached a point of unsustainability? In good old times past it used to be that when complacency reigns on Wall Street, investors get wet. It’s different in a QE world; When complacency reigns, investors get wet eventually. Are investors complacent? This is a bold statement. There was not only the earnings explosion of the late 1990s, there was also the financial leverage earnings explosion of the mid 2000s. In 2007, earnings of the financial sector (corresponding ETF: Financial Select Sector SPDR – XLF) accounted for over 40% of all U.S. profits. It’s hard to believe that S&P 500 earnings today are 77.6% higher than at the 2000 peak and 10.3% higher compared to the prior 2007 all-time high. A voice of reason often tends to get over looked in an unreasonable world, but the chart below reminds us of unpopular past realities. Mean reversion took many by surprise and earnings peaks turned into stock market peaks. What do earnings tell us about stocks? Corporate earnings aren’t a short-term timing tool and shouldn’t be used as such, but record earnings sow the seeds for subsequent declines. The S&P is currently trading just above a major long-term support/resistance level. As long is it remains above support, stocks may grind higher, but a trip below may quickly turn into a fast and furious decline. The Profit Radar Report highlights the support and risk management levels needed to avoid a surprise move. Investors have no clue what goes on behind closed doors at Wall Street banks and the Federal Reserve. But once and a while a juicy piece of information (probably overlooked by censors) provides a glimpse of Wall Street’s carefully guarded secrets. The New York/Washington Banksters do a good job of keeping internals hidden, but once in a while a juicy nugget escapes. Those kinds of nuggets make investors lose faith in everything Wall Street, that’s why Banksters like to keep them secret to begin with. 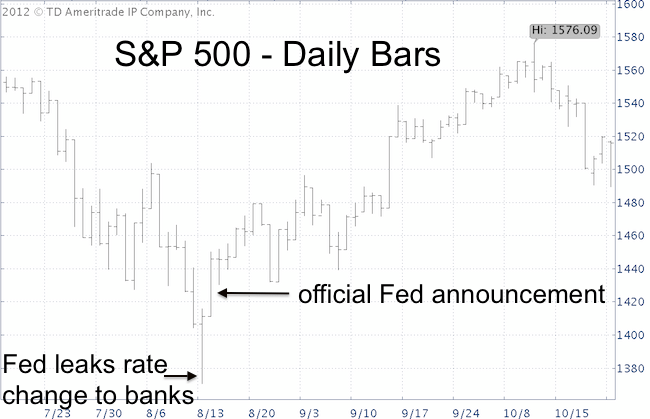 Insider Tips from the Federal Reserve? On August 17, 2007, the Federal Reserve cut the discount rate from 6.25% to 5.75%. The Fed is quite careful about changing the discount rate, and when it does it’s usually only tweaked by 0.25%. The 0.5% cut on August 17 was ‘unexpectedly’ drastic. The Fed regularly releases transcripts of its policy meetings with a 5-year lag. Courtesy of such a release we are now getting a glimpse of what happened leading up to the August 17, 2007 meeting. What difference does this make you may wonder. The chart below provides a nice visual. The Fed hasn’t had a chance to lower rates in years, but right before the financial crisis interest rate announcements sparked anticipation like nothing else. At 2pm on August 16 (a day before the official announcement), stocks started to soar for no apparent reason. The S&P 500 jumped 45 points within a matter of hours and recorded its best gain in 4 ½ years. Financial ETFs like the Financial Select Sector SPDR ETF (XLF) soared as much as 16.95% that day. The SPDR S&P Bank ETF (KBE) gained as much as 7.26% that day. Over the next few weeks, the S&P 500 continued to rally more than 200-points. It went as high as 1,576.09. The rest is history with still much mystery. Although with a more than 5-year time-lag, we now find out that the Federal Reserve kindly gave the big banks a friendly heads up. The Treasury declined to make Geithner available to comment. Spokesmen for the Federal Reserve Board in Washington, the New York Fed, Bank of America, and Ken Lewis all declined to comment. The December 2, Profit Radar report predicted new recovery highs, but warned that: “Any new recovery high marked by a bearish price/RSI divergence could mark the end of this rally.” That’s exactly where we’re at now. Research studies show that investors as a group buy high and sell low. The media fuels this kind of crowd behavior, trashing stocks near a bottom and hyping them up near the top. The “headline index” – a fictitious index based on a not entirely worthless evaluation of media sentiment – depicts a media more cheery than any other time in 2012. The upside is limited whenever the media is implying a sustainable rally. But this article isn’t about sentiment or the media; it’s about a technical divergence. One that incidentally runs contrary to the media’s blissful mood. The Relative Strength Index (RSI) is a very basic and commonly used momentum indicator. I usually don’t subscribe to popular indicators (the more folks use any given indicator the less effective it is), but RSI just happens to work very well for me (perhaps because I use an unusual setting to make it more ‘special’). My simple theory is to look for unconfirmed highs or lows. Any new price high/low unconfirmed by a new RSI high/low is a bearish/bullish divergence. This theory works at multiple time frames. I like to use it for spotting highs/lows that last for weeks or months. This simple strategy has helped me to identify the May 2011 top and October 2011 and June 2012 lows. The chart below is visual evidence that every bigger top since 2010 (vertical dashed red lines) sported a bearish RSI divergence (new price high without new RSI high). The September 14 high fooled me, because there was no bearish divergence (dashed green line). Due to the lack of divergence, I refused to abandon my outlook for new recovery highs above 1,475, which at the time was quite unpopular. 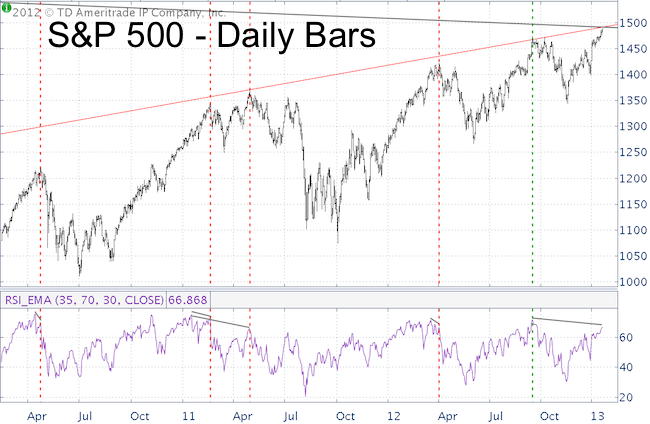 As of last week, the S&P 500 recorded new recovery highs above 1,475 void of a new RSI high. In itself, that’s not a sell signal, but it’s a red flag. As with any indicator, RSI divergences become more potent when confirmed by other technical indicators or support/resistance levels. I was excited to discover two important resistance levels not far above current trade. In fact, one of the resistance levels caused a major S&P 500 reversal in May 2011, one that shaved nearly 300 points off the S&P. It can be treacherous to buck a QE-stock market on a mission, but this major inflection point along with the bearish RSI divergence and increasingly bullish sentiment suggests definite caution ahead. The Profit Radar Report reveals the key resistance level (and target for this rally) along with conservative and aggressive trade recommendations to take advantage if this strong inflection point. 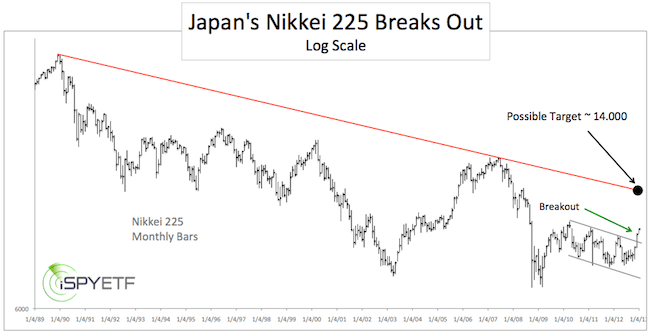 Is Japan’s Nikkei Rally for Real? For four years the Nikkei’s performance has been flat as a pancake, but recent price action suggests that the time of boredom is over. 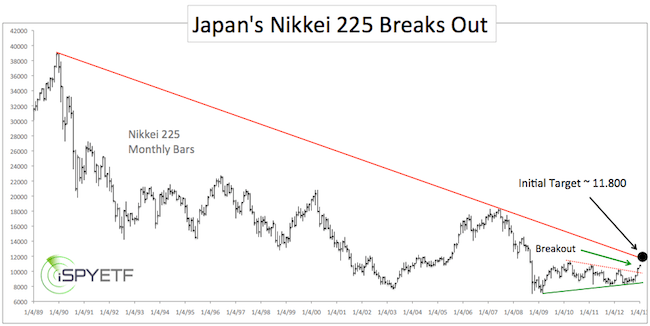 A technical breakout looks to support the agenda of Japan’s new Prime Minister and higher prices for the Japan ETF. Look at Japan and you see decades of economic contraction, which triggered dozens of financial stimulus packages. The new Prime Minister Shinzo Abe has vowed to continue the legacy of money printing. Shinzo Abe announced Friday a $225 billion package of public works and other projects just after the Japanese government approved yet another emergency stimulus plan worth $116 billion. Japan’s government debt is now about 230% of GDP. Such fire hose financial dousing failed to buoy the Nikkei in the past, but this time might be different. Why? Shinzo Abe has bullish technicals on his side, at least for now. The Nikkei 225 just broke above multi-month trend line resistance and out of a multi-month trend channel (log scale, second chart). As long as the Nikkei remains above trend line or channel resistance (now support), Japanese stocks will likely rally to their next resistance level. Where’s that? The first chart pegs red trend line resistance around 11,800, about 9% above current trade. The log scale chart (second chart) shows the same trend line around 14,000, about 30% above current trade. A move above trend line resistance around 11,800 is needed to unlock the much higher target around 14,000. Obviously, there will be pullbacks along the way, but the trend for the next few months looks to be up. ETFs with exposure to Japan (Japan ETFs) include the iShares MSCI Japan ETF (EWJ) and Ultra MSCI Japan ProShares (EZJ), a double leveraged long ETF. Wow! Apple, the world’s largest company lost 31.6% of its market capitalization since mid-September. This week’s new price low showed the first real bullish divergence. Is AAPL’s decline over, at least for now? The shares of the world’s largest company recovered a bit after falling as much as 31.6%. What’s the bigger story, the 31.6% drop or Wednesday’s 4% recovery? The chart below shows that Wednesday’s low at 483 occurred right around double green trend line support. The new low was carved out against a bullish RSI divergence. Will that be enough to get Apple shares moving higher again? percentR, the same indicator we used to confirm Apple’s top, has moved from below to above 20. This is considered a bearish low-risk entry. The regular ‘default trade’ is to go short with a stop-loss (based on closing prices) at Wednesday’s high. However, going short may not be the greatest idea since Apple precisely hit our down side target against a bullish RSI divergence. It may be better to use RSI as an initial change of trend confirmation. A close above 510 would be positive. I like looking at sentiment extremes to gain an extra edge. Bullish extremes are bearish for the stock and vice verse. Unfortunately, there are no sentiment extremes for Apple. The short interest on AAPL is within the normal range (about 2% of outstanding shares) as is the options put/call ratio. Other options measure a closer to optimistic than pessimistic extreme, which is odd considering Apple’s 31% tumble. AAPL has enjoyed a multi-year bull market with average annual gains of 63% since 1998 (the first year of profitability after Steve Job’s return to Apple). For that reason Apple’s seasonality has a distinct bullish bias. The beginning of the year is generally less bullish for Apple shares, but obviously a 14-year predominantly bullish seasonality chart is little help during this bear market period. Sentiment and seasonality don’t provide much of an edge, so we’ll keep technicals in the driver’s seat. Based on the bullish RSI divergence there’s good potential for a bounce. percentR suggests to wait for a close above 510 before going long. Due to the potential for an upcoming S&P 500 reversal, it will be smart to elevate stop-losses if prices do rally and keep a stop loss no lower than 480 initially.